While GXS is a pure SaaS model, Inovis has a big mid-range customer base running software. Both companies have a large VAN business but the stand-alone VAN business has become a commodity. Where I believe this is a HUGE win for the two companies is in the 'Value Added' services of Item Master Database and Business Intelligence. 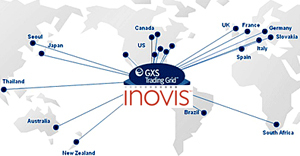 Inovis has the catalog services of the former QRS company and GXS has their popular PIM solution. The industry has long been attempting to sync item data and outsource the process to the supplier. Now the combination of the two companies will give GXS further critical mass to fill the need. As the largest network, the other big value add is business intelligence. Inovis bought a company called BetweenMarkets a couple years back. BetweenMarkets technology and market approach was ahead of the times. They offered companies real-time views into what business was really being transacted between trading partners. They offered dashboard views of the order to cash process, insight into shipping and invoice shortfalls, and supply chain KPIs. It is a unique picture of business process management that you cannot get out of Oracle or SAP. A couple years back this was a hard sell because businesses just didn't understand it. Today, winning companies are just catching on and GXS, the largest network, is best positioned to win this business. Who will be able to compete with this? Sterling Commerce ( AT&T )? Yes. They are still an industry leader that is considered the Cadillac for their software and support. They also have a unique set of solutions that dig deep into solving supply chain issues. But this merger may force them to realign their industry focus and positioning. If you are one of the many smaller players, this might be a good time to consider an integrated technology partnership with GXS. Knowing your customer base well, and understanding your market niche better than anyone, I would find out how to plug into APIs on "the grid", and build out custom extensions for your clients. One big hole in the consolidated portfolio is web based on-boarding solutions for the SME market. Both companies utilize web 1.0, circa 1995, custom built hub-centric web forms to address this market. Maybe Bob Segert's next purchase will be a web based EDI engine for the SME market. Bob, what do you think of SPS Commerce? I might know a couple of others. The consolidation of services between the overlapping portions of the merged company's portfolio should give a nice boost to the bottom line of the company. This will allow GXS to focus investments on higher growth international markets including Asia, Europe and South America. This is another reason why it makes a lot of sense to offer a scalable web based EDI engine. I also see some risks and merger pains. One, as Marc Benioff proclaimed, "Software is dead." Software makes up a big portion of Inovis' business. An even bigger portion is the software maintenance fees. The GXS model is purely SaaS. The merger gives them a big mid-range database of existing software customers to mine for integration outsourcing but this will cannibalize the higher margin maintenance income. As Sean Feeney mentioned in his statement, the merger was 'inevitable', but will they have the courage to move clients off software to a less profitable supply chain 2.0 model? Don't be shy, register and leave your comments below.